This funicular railway dates back to 1854. Marty learned firsthand how important financial planning can be when, in the 1970s, a grocery chain put his father’s small store in Knox, Pennsylvania, out of business in just a few months. Although Marty’s father didn’t have a pension, his lifelong commitment to investing helped enable both his mother and father to live many comfortable years in retirement. A Certified Financial Planner™ professional since 1987, Marty has dedicated his professional life to helping successful individuals and families accumulate and preserve wealth to protect their future. 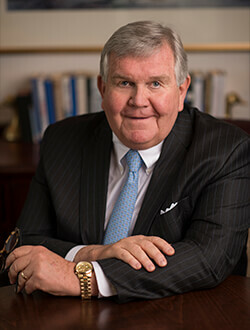 In 1991 he became a registered principal with Raymond James Financial Services and established his own practice, assembling a skilled team to serve clients with highly personalized and integrated financial planning. Marty believes our practice’s success is measured by building each client relationship around trust, accountability, transparency and communication. Clients appreciate his independent, objective advice and holistic approach to handling issues that are important to them. He strives to understand each client’s unique situation so he can help them feel confident and in control as they navigate life’s financial challenges, like planning for a comfortable retirement, selling a business, navigating the issues associated with a divorce or managing an inheritance. Marty graduated from West Virginia University with a B.S. degree in finance and holds his Series 1,3, 24, 31, 53,63 and 65 licenses. He is a strong believer in giving back to the community, having served on the boards of Mount Aloysius College and the Altoona Symphony, and as past president of the Altoona Rotary Club. From 1990 to 2000, Marty hosted “Investment Matters,” a live call-in talk show on WRTA-AM radio. He currently serves as Treasurer of the Board of Trustees at the Southern Alleghenies Museum of Art and, as an avid sailor, captains his San Juan 21 sailboat at Lake Glendale. *Membership is based on sales production. Re-qualification is required annually. Membership years: 2004, 2005,2006, 2007, 2012, 2013, 2014 2015, 2016, and 2017, 2018. **Business nominated must have or have had operations in Blair County for at least 15 years. Business should have completed the minimal 15 years of business in 2014. Business nominated shall be cited for business accomplishments. Business should demonstrate overall stability and growth in Blair County facilities, employment increases at Blair County facilities and increases in customer radius from Blair County operations. When compared to others in the industry or field of competition, business nominated should have a leadership position. Business should enjoy good visibility and image in the community. Company employees should enjoy a good "quality of life" in the work environment. Civic and/or volunteer work will be considered as well. Business nominated is not required to be a past or present member of The Blair County Chamber of Commerce. Securities offered through Raymond James Financial Services, Inc., member FINRA/ SIPC. Investment advisory services offered through Raymond James Financial Services Advisors, Inc. Kooman & Associates, LLC is not a registered broker/dealer, and is independent of Raymond James Financial Services.